Shiplap to the ceiling, but ceiling isn't level - thoughts? 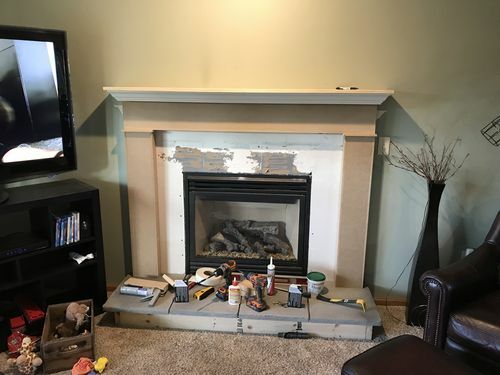 This weekend I plan to finish up our fireplace surround makeover. The attached photos are where our fireplace stands currently and the other photo is what we have been using as inspiration. Things have gone very well, however my wife has seen just one too many “fixer upper” epidsodes and would like shiplap going from the mantel to the ceiling. Thats all well and easy – I took some 1/2 mdf and ripped it down to 4” strips. I plan to use my dado to create the rabbet cuts. 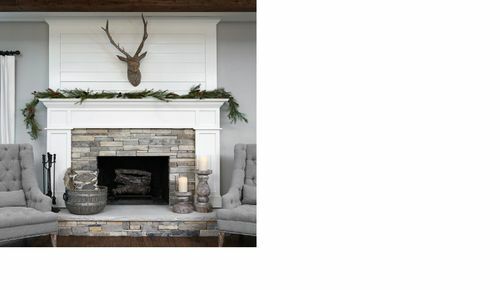 If you notice from the inspiration photo, the shiplap and the vertical frame are the same size, but the top horizontal strip that is partially covered by the crown is slightly wider. 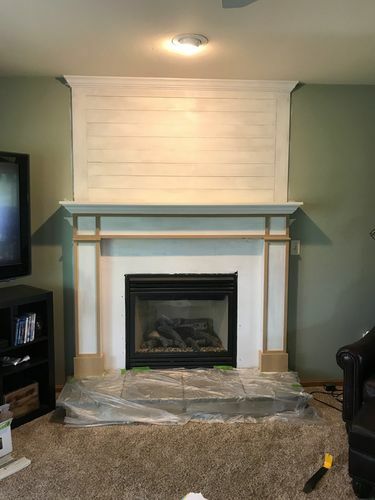 My issue is, I know my ceiling isn’t perfectly level the entire 68” length and I’m worried how to fit the shiplap and this horizontal frame piece and not have it look like trash. For example, I could cut the last piece (the wider frame piece) to fit to the ceiling, but then when I put the crown on I think it’ll be obvious the crown is closer to the joint below it on the left versus the right. I believe the ceiling runs about 1/2” or so over the 68”. I will double check this tonight. About the only idea I have at this moment is to make that top frame piece significantly wider than the 4” shiplap to try and get the crown further from the next shiplap joint. We are not dead set on crown at the top, but she would prefer it. There are a few ways to go. First of all, I would never use MDF for ship lap the character of real wood when used for ship lap idea looks much better than MDF in my opinion. you could slightly taper each piece of your faux ship lap to make up the difference. If it were me I would end the crown molding on each side of your framed overmantel if necessary you can add some additional molding on the top of your over mantel to equal or exceed the height of your crown molding.You could go with your original thought and taper the top board of your overmantel. I ran into the same issue and just held the crown off the ceiling. I like the shelf effect. a1jim – I’m not sure I completely follow you. Let’s say as an example you have 8 ship lap boards if you taper each board from full width to lets say 1/16 less on each on one end that would equal 1/2”. so if boards are 4” to start the tapered boards would be 4” on one end tapering down to 3 15/16 on the other end. a1jim – I got the tapered part. the part about ending my crown confused me. In your first photo it looks like the crown goes over the overmantel if you’re going to end the crown on both sides you may want to have the overmantel top to be equal with the highest point of the crown molding that’s where I was suggesting adding another piece of molding if you want the overmantel to match the crowns height. Of course, your going to have more than ten boards in my example so you may only need a 1/32 on each board or however the math works out. Build the frame square and scribe it to fit. The top board of the frame would have to more than 8” wide to hide a 1/2” difference. Hopefully it’s more like a 1/4”. How much is it out of level? If not more than 3/4”. I’d story pole both sides and simply pull the lap joint wider at 1 end. 1/16” to 1/8” in a 4’ span is hard for the eye to pick out if they are all lapped the same. 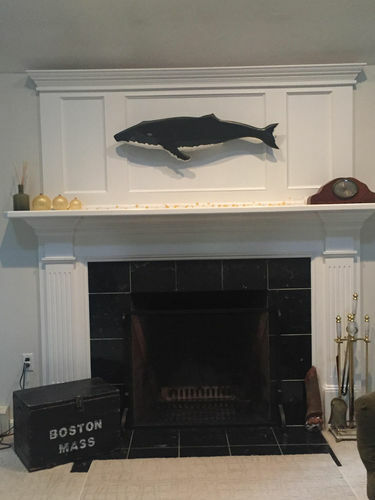 I’m not entirely sure on the gap – After I got the mantel done and the peanut gallery (wife and my dad) got to view it from a distance, we all thought the mantel was slightly out of level. Upon putting a level on it, it was dead on, so after I got defending my workmanship, we quick and dirty measured the ceiling at both ends of the mantel and I believe my dad said he was getting 3/4”. Now he was just doing it quickly with a tape measure and was measuring to the front of the mantel (so the hypotenuse really). I’ll have to measure it more closely this evening, but for sure it’s not perfect because I can tell standing far enough back. I’m not sure what the story pole is (assuming you mean the vertical frame) but the consensus here and from my coworkers is to intentionally install each lap board unlevel so when I get to the top, it mates well. Sounds doable. I’d really like to try avoiding cutting the top board at an odd incline if possible. I’m hoping my dad (who is as far from a woodworker as humanly possible) just didn’t measure it well and it’s something that can be easily dealt with. The house was built in 2006 and there is no cracks from settling and I never noticed it before when the old mantel was there, so maybe it’s not as extreme as I’m fearing. Any discrepancy is going to show up more with horizontal boards or panels. If you could do vertical boards, or a solid panel, I doubt if the levelocity would be a problem. (my spell check doesn’t like “levelocity,” but it makes me smile when people look startled upon hearing it. It’s vertical correspondent is plumbilical). Most remodelers know that it’s a rare house that is perfectly plumb and level anywhere. I didn’t realize how out of level my kitchen ceiling was until I was putting up the crown. Instead of trying to scribe the molding, I simply squeezed lightweight spackle into the gap at one end. Being white, like the ceiling, it doesn’t show at all, whereas the dark colored gap was very noticeable. Sorry. Story poles are used in masonry. You measure the height on each corner you need to hit. With either a modular or brick rule. Turning the rule over you have the number of courses and the height of each course to hit that height. You mark each needed course height on a pole set at each corner( the story pole). Each pole may have different course heights, but the number of courses are the same. Stretching a line between the poles gives you the top of each course. They may or may not be level, but they fill the space between, say the footer and eaves. Story poling just means to divide up the difference and level it out. That being said, I measured carefully before I started and I was a hair less than 1/4” over the 68” run. So I carefully make my shiplap and rabbet cut them all and fit them all up with just using pennies to see what I would end up with – I could not for the life of me convince myself it was noticebale. My wife was unaware of which way it was “crooked” and she couldn’t tell, so I left it. Now, the crown at the top was an absolute adventure that took over an hour – the long run was simple enough, but the little tiny pieces that went back to the wall (less than 1” at the bottom of the crown) was a pain – I couldn’t use a scrap piece over and over again to adjust my angle because it got so small I couldn’t hold it safely when cutting. Eventually I got them to fit – but I couldn’t set my saw at 45 deg and hold the crown to it – I ended up doing a coumpound miter cut at some varied degree to fit it due to the 1/4” slope – or either that, I’m an idiot – both very plausible. At any rate, everything is constructed and now its sanding, priming and painting – which is satisfying, but also the worst part of the whole job! The wife is over the moon, the mother-in-law is jealous and the father-in-law is now mad at me for giving his wife more ideas for their “fixer upper” home haha.